If an error code doesn't appear because of a programming error, several things can happen. 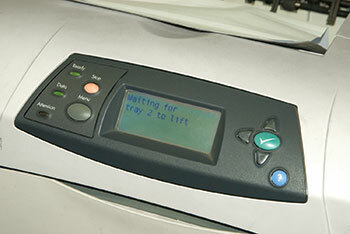 Some LaserJet printers show a status message without being able to print. One such message is WAITING FOR TRAY X TO LIFT. The best documented case is with the 4250 and 4350, but we’ve also helped customers fix the problem with the 4345 and the M60x. We've heard reports over the years of the message occurring in the Color LaserJets 4700, 5500 and 5550. This behavior has nothing to do with the lifter mechanism, the failure of which would produce a 60 error. This article presents LPT's current knowledge of this issue based on our tech support call record and recent in-house testing.